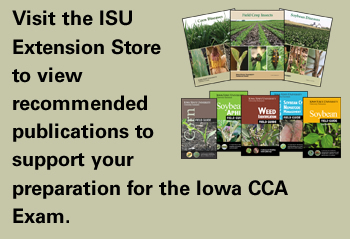 Iowa State University Extension and Outreach, with support from the Iowa Certified Crop Advisers Board, has developed and is now offering an online review course for individuals taking the Iowa CCA Examination. This course is offered exclusively online - there is no live, classroom component. See the requirements section for additional technology requirements. This course is divided into 4 main topics: Crop Management, Pest Management, Nutrient Management, and Soil and Water Management. Each topic is further divided into several subtopics. All presentations are available in PDF format for printing which may be helpful for note taking. Each presentation also has an accompanying practice quiz. Quizzes are made up of up to 10 random questions from that particular presentation. Quizzes may be attempted up to 3 times. Supplemental materials will provide access to additional information supporting that topic area. The course also includes a practice exam covering all topics. The practice exam may be attempted 3 times. The official Iowa Certified Crop Adviser exam is offered twice a year; February and August. Registration for the exam is handled by the National CCA Organization. The next CCA Examination is August 2, 2019. Registration period for the exam is April 22, 2019 - June 22, 2019. Exam registration is not handled by Iowa State University. You do not have to be registered for the exam to complete this online course. Purchase of this course does not include exam registration..
Access to this course is limited to a single examination period and will end the day following the Iowa Certified Crop Adviser exam. The online review course is closed for renovation and technology upgrades. More information will be posted soon on an anticipated re-opening date. A recent computer (within past 5 years) with a web browser and a connection to the internet. The course is not accessible offline or without a live connection. A printer if you wish to print out the PDF versions of the presentations. The Flash Player browser plug-in is needed to view the presentations. If you don't have Flash Player, you may download it for free. Mobile devices: the Flash-based presentations of the course are not available on iOS devices such as iPads. All other materials including quizzes, PDF files and supplemental materials remain available. For the best experience a desktop or laptop computer is recommended. For assistance with registration, receipts, billing, or questions on the status of your registration contact ANR Program Services at (515) 294-6429 or anr@iastate.edu. For questions regarding the CCA program and course content please contact Bob Hartzler, Extension weed specialist and course chairperson, at (515) 294-1164 or hartzler@iastate.edu.